One year olds are now just beginning the toddler phase where they begin to walk, talk, imitate adults, and explore their world. In a sense they are busy seeking opportunities to learn about the objects in his or her environment. The toddler is learning relationships – where things are located, which things go together, and what things do. Young toddlers are also learning through their senses, so encourage these children to not only look at an object, but to smell it, feel it, experiment with the sounds it makes, and maybe eat or taste it. Below are fun activities to try – remember children learn through play. Toddlers are very active. As soon as they get on their feet, they seem to want to use their large muscles to walk, run, climb, and be on the go. Toddlers are also using small muscles to make their hands do many new and controlled motions. These activities help toddlers practice their motor development in fun and safe ways. Make sure to provide a lot of play space where toddlers can move easily, whether indoors or outside. All climbing and riding toys (no-pedal type) must be safe and age appropriate for very young children. They should be low, no higher than 1 – 1 1/2 feet off the ground. Have a soft surface underneath, such as mats, sand, grass in case of falls. In addition to riding toys, provide lots of balls, pull toys, and even a balance board on the ground for walking practice. Make sure to hold the toddler’s hands to help with balance. Young toddlers love to imitate adults and older children. Play some music and play a copycat game where the child mimics your actions. Ask them to wave their arms, rock from side to side, nod their head, stamp their feet, shake their hands, and so on. Another fun activity and one that toddlers love is playing with boxes. Place two or three large cartons in the middle of the room. Let the children climb in and out, crawl through like a tunnel (if the openings are cut out), or just sit inside. Leave the boxes out for free play whenever possible. Toddlers need to develop their small muscles using their eyes, hands, and fingers. They also will begin problem solving with these activities. Think about having pull-apart toys, very simple puzzles, boards with zippers and knobs, texture books, and materials to draw with. Just make sure that these toys are large enough so they are not choking hazards and supervise these children when using small manipulative toys. For art activities, use large fat crayons for drawing and homemade finger paints with pudding as a painting medium. Children at age one still have a habit of putting everything in their mouths. Take the coffee can lid and cut an X in two to three places in the plastic lid (use your judgment as to how many places you cut according to the size of the lid). Give the child several jar lids to play this game. First, let the toddler examine inside the container. Put the plastic lid on and point to the holes in the cover and show him how to push the jug lid through the X. When the jar lid hits the bottom of the can it makes a “clink” sound which toddlers love. Hand-on-hand, practice putting all the lids inside the can and then open the lid and pour them out again. This activity helps to develop eye/hand coordination and problem solving skills. One-year old children are just beginning to talk. In order to learn new words, they need to hear words spoken by adults. For example, the child may say "juice" and it is the teacher or caregiver that should expand on this word by saying what kind of juice, that this is part of snack or lunch, and ask him if he likes his juice. Talking with toddlers is an important part of your daily activities. During circle time, have a bag of toys or objects. 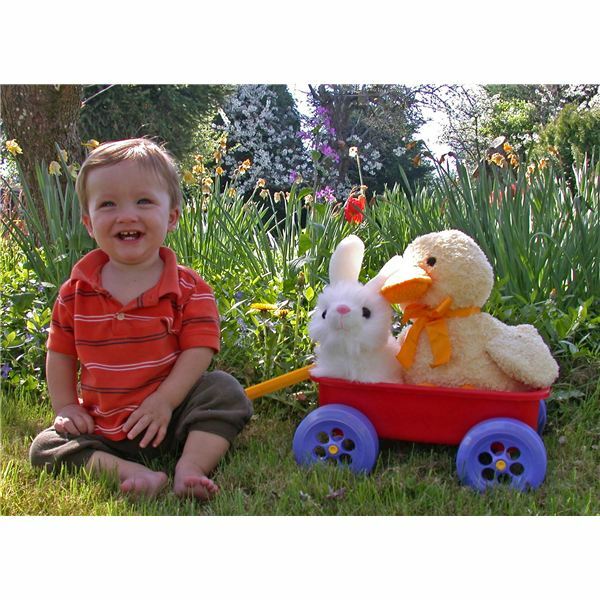 Pull out a toy and talk about it, or use puppets to make talking more fun for the toddlers. Even if conversation is one-way, the child is learning by hearing your words. Use music and piggyback songs to transition toddlers during your day. Cut the cardboard to fit inside the zipper locking plastic bag. Make several bags to make a book. On the cardboard, glue pictures of familiar things a toddler will recognize. Photocopies from photos at home will be useful to make a family book. Place the finished sheets back into the plastic bags. Take all the bags and sew the unopened edge together on a sewing machine or punch three holes and lace them together with ribbon. Invite the toddler to look at the pictures and say words together that reinforce the picture. When toddlers tire of the pictures, the book's pages can easily be changed by adding new pages inside the plastic sheets. Young toddlers need plenty of opportunities and encouragement to learn new things in their world. Play with your toddler and incorporate some of the above activities into the daily routine. This will ensure that they are using motor skills that help in their development. Make sure to use praise and understanding which helps the toddlers develop the self-esteem that will help them to be confident and successful in life. Personal experience from teaching “Mommy and Me” classes.